When my newly married friends Vanessa and Jon recently honeymooned in Thailand, I went along with them. Well, not really, not physically in the third wheel sense (cause how awkward would that be?) but vicariously through the Instagram pictures Vanessa posted daily. Vanessa’s street food stories, like the ones I read on another favorite blog, The Londoner, left me with not only more wanderlust than ever, but with a ravenous hunger for Thai food. So when I asked a friend for a lunch recommendation on the Upper West Side earlier this week and she suggested a place called Thai Market, it was just what I needed. 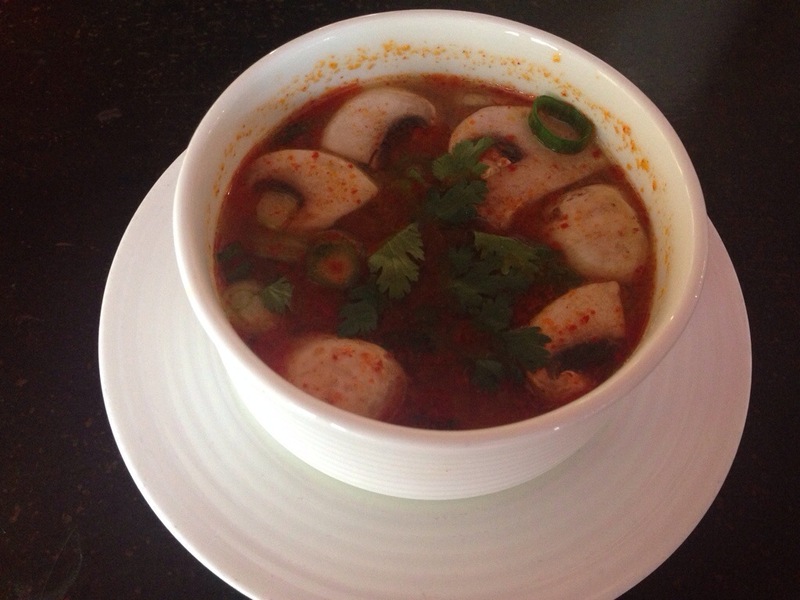 Tom yum goong soup. 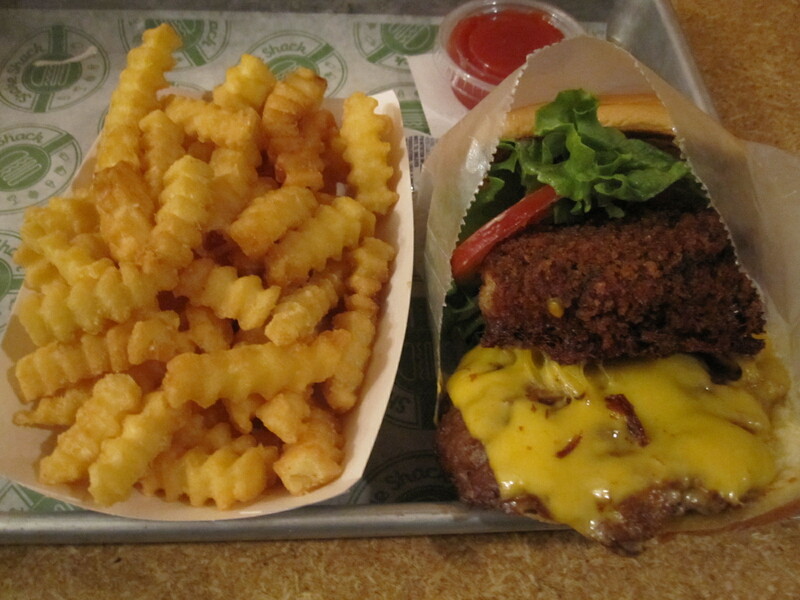 Emphasis on the yum. To start, I had the tom yum goong soup, a reddish-brown blend of tangy, zesty lemongrass, tamarind, juicy shrimp, and plump, soft mushrooms. It was colorful and warming, with just enough spicy heat to give my tongue a tingly little prickle without breaking out into full on nose sweats. 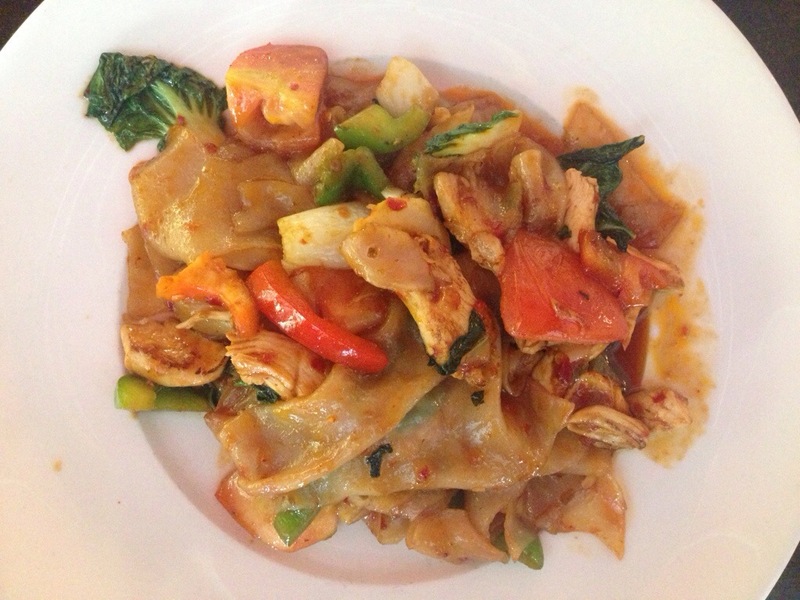 Pad kee mao… that means give me more, right? After it, at the server’s suggestion, I ordered the pad kee mao, large, flat rice noodles with tender strips of chicken, Thai basil, chili, tomato and bok choi. It wasn’t crazy hot but this time I definitely had to guzzle cold water throughout eating it. The flavors, like the colors of the different ingredients, were bold and bright, with chunks of bright green peppers, juicy tomatoes and red swirls of chili oil all mixing around in the most delicious way. The restaurant’s overall look is supposed to transport you to Thailand, with giant photos of markets as a backdrop, along with Thai street signs and large red umbrellas that kind of make you feel like you’re outside. I popped in for lunch, and while I don’t doubt that the food sold by street vendors and at markets is way better and cheaper, Thai Market’s $8 lunch special makes it a pretty good alternative for being on the UWS. To say that Levain Bakery‘s signature cookie, the chocolate chip-walnut, is just another cookie is like saying that a unicorn is just a horse with a horn. It’s SO much more than that. It’s magic, it’s wonder, it’s a source of pure, concentrated joy. Levain’s signature cookie might just be the single most delicious chocolate chip cookie in the universe. If a greater one exists, I almost rather not know about it, I’m not sure my little heart could handle all that. 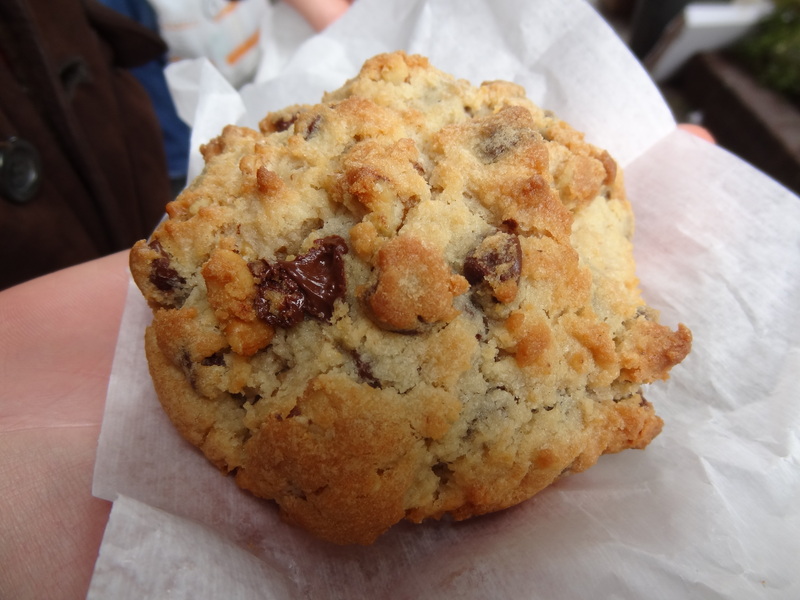 It already came so close to bursting with happiness when I bit into Levain’s chocolate chip-walnut cookie during a recent day spent in the Upper West Side. At a hefty $4 it might seem like a lot for a cookie, but like I said, this is no ordinary cookie. About four inches in diameter and with a mind-boggling height of about two inches, this cookie is big. Jutting out from its craggy surface are golden chunks of walnut next to soft, fat smudges of chocolate, half melted chips just begging to be eaten. The outside has a nice, firm crust but the real magic—oh man, my heart speeds up just thinking about it— that is waiting inside. The moment you bite into this cookie masterpiece you realize that it’s just the exact amount of cooked (or wonderfully uncooked, I should say) so that the core is soft and chewy, still a bit cookie dough and not completely turned cookie. The chocolate chips melt pretty much on impact and the walnuts lend a buttery, nutty crunch to everything. It’s madness, I tell you. Madness. I’m a huge fan of Roasting Plant’s chocolate chip cookies, which I previously wrote might be some of the best I’d ever had, but Levain’s, I’m pretty positive, are the best this whole universe of ours has to offer. How I’ve lived in this city for this long without having one makes me think I have a lot of catching up to do. And let me tell you, I’m excited. Just when I thought pumpkin-flavored foods had been retired till November, BAM! I found something new! 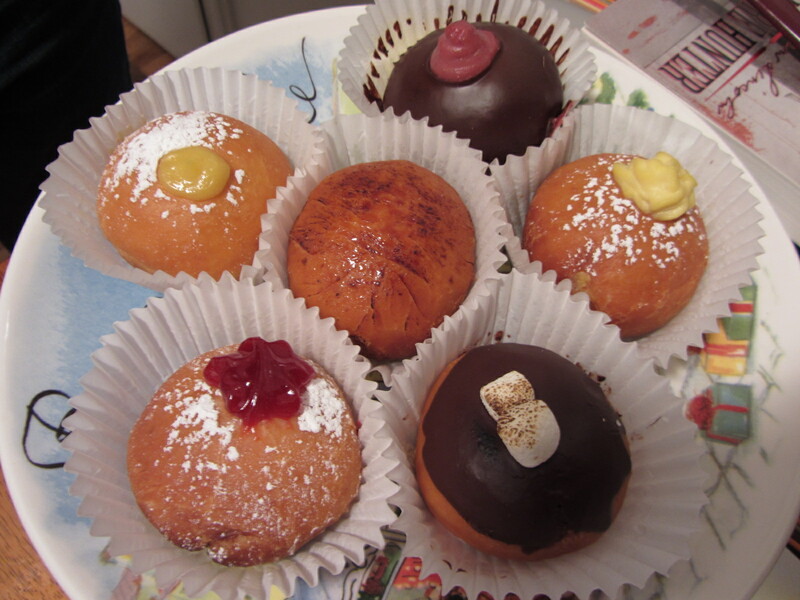 And delicious, I might add. This classy cocktail from the Mandarin Oriental’s Lobby Lounge, made me want to rekindle my annual pumpkin binge. 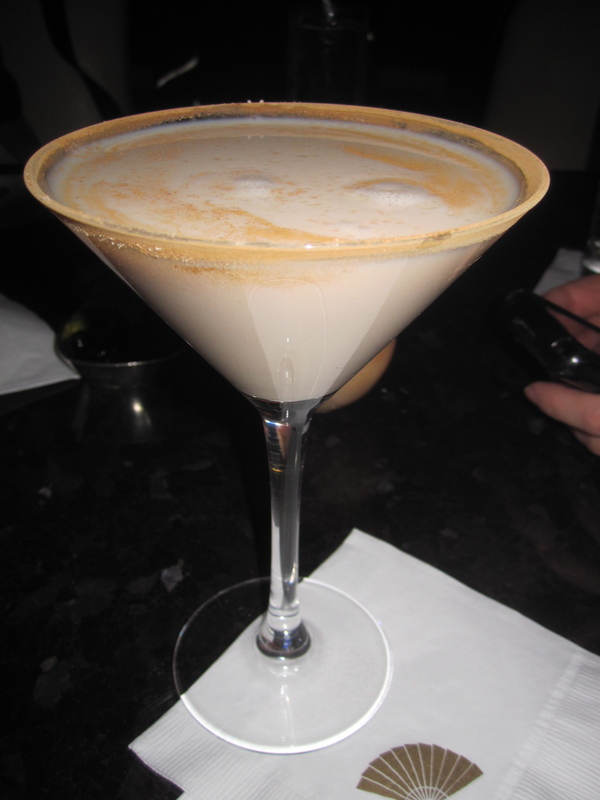 The creamy, dessert-like drink was a velvety sweet concoction of Stoli Vanilla Vodka, Kahlua, Coole Swan Irish Cream, pumpkin purèe and spiced pumpkin syrup. Sigh. It’s always a good time for pumpkin. After a night of too much drinking and staying up too far past my bedtime, I like to seek comfort in food the next day: usually standard American breakfast classics, preferably greasy, and heavy on the carbs. Biscuits and gravy in particular are a life-renewing source for me. 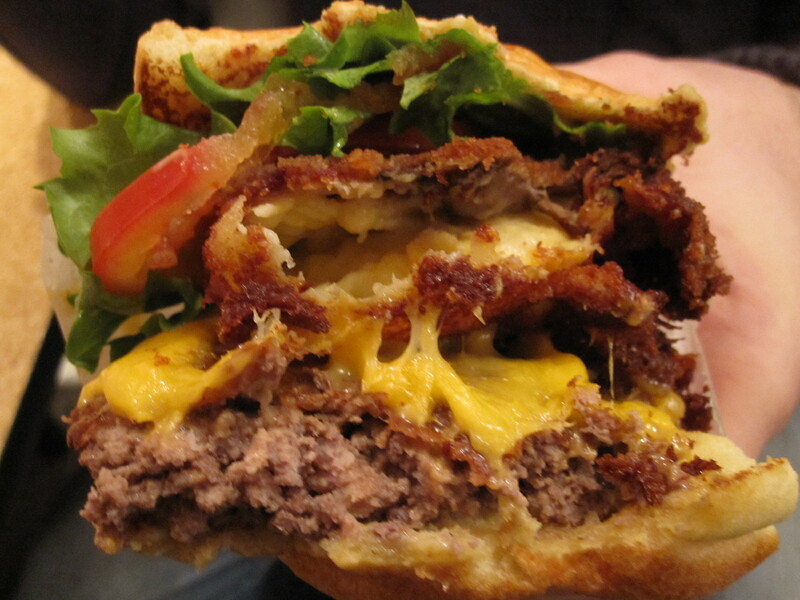 But not all hangovers are created equal and neither are their cures. Just the other day, for example, a friend told me about an out-of-town guest of hers who wanted to know where to go for curry, because that’s what he woke up craving after a night on the town. Curry! Can you believe it? Now, I love curry— don’t get me wrong—but after a night of boozing? Not likely. 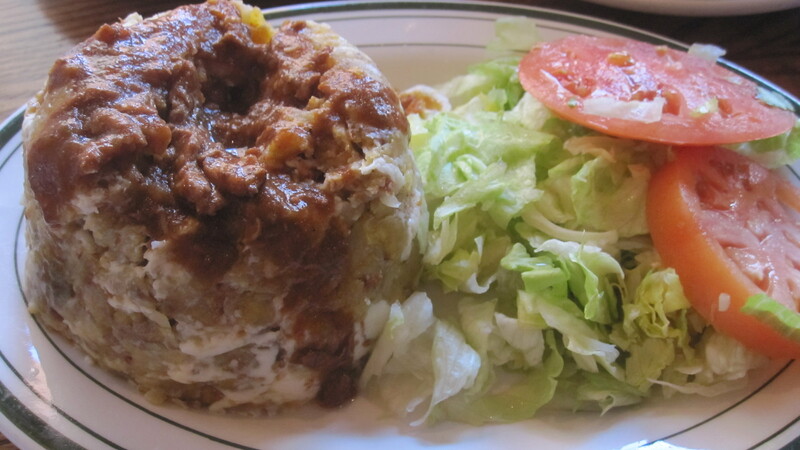 Recently though, while staying at a friend’s apartment in Astoria (while I waited to move into my own apartment) my gracious host came over to my room (her guest room) and asked how Flaneur and I felt about going for mofongo. No gelato for this guy. Of all the things I saw that blew my young, impressionable mind, it was something at the Smithsonian National Air and Space Museum‘s gift shop that excited me the most: astronaut food. The package said it was exactly like what the real astronauts ate in space, and I was sold. $3 later I ate dehydrated strawberries thinking they were the coolest thing ever. Fastforward to almost 14 years later… strolling through the American Museum of Natural History’s space gift shop after seeing a show at the Hayden Planeterium, I saw a familiar, over-priced, edible souvenir: astronaut food! 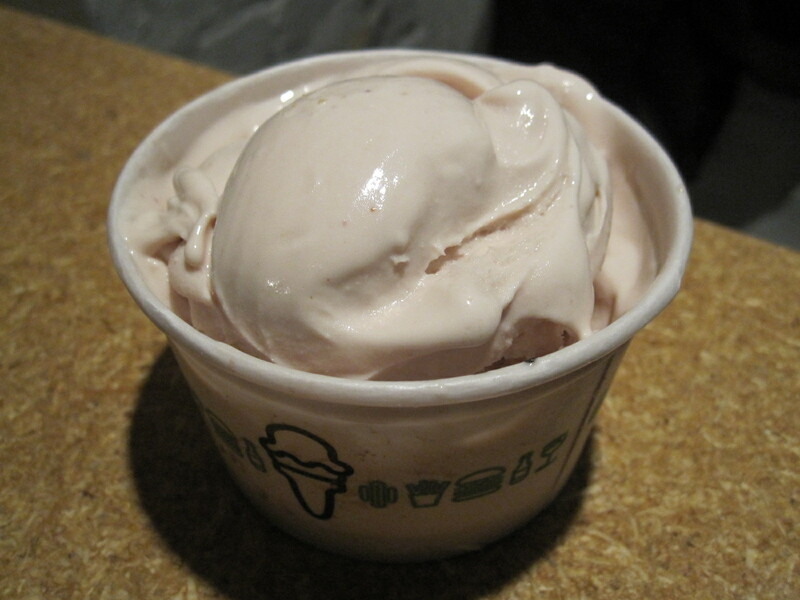 There's no substitute for real ice cream. 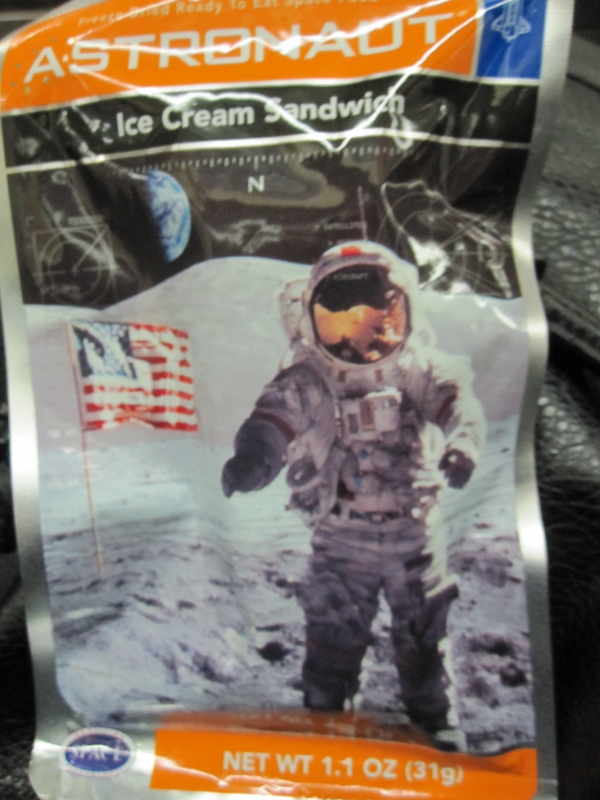 $4.34 later, I left the museum and gift shop with a dehydrated ice cream sandwich alla astronaut, just as excited as I was the first time I tried this gimmicky space food. Later that night, I tore it open and Flaneur and I bit into respective chunks of crunchy, dry, almost dusty ice cream sandwich. 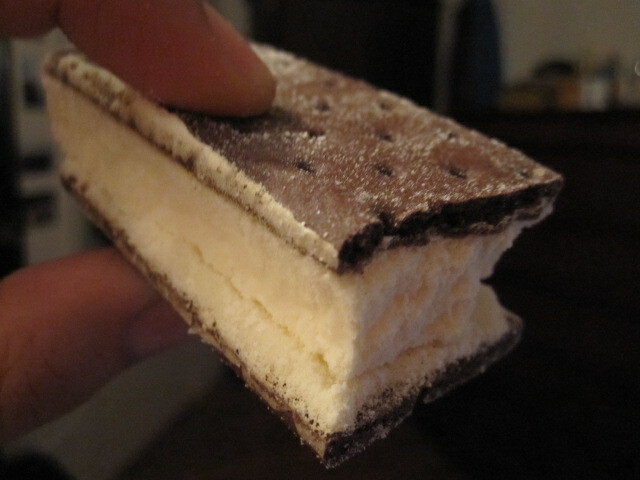 Yes, it looked like an ice cream sandwich, and sure it kind of tasted like one, but in no way was it as good as a real, cold, creamy-on-the-inside, soft-cookie-on-the-outside ice cream sandwich. We ate it none the less, and I for one was glad I never became an astronaut. Sure, space is cool and all, but chalky, dry ice cream sandwiches? No thanks. I’ll stay here on Earth with the creamy, delicious cold stuff.